Increasingly, Artificial Intelligence (AI) systems or artificial agents begin to replace human decision makers in real life. For example, software systems currently assess someone’s risk profile and financial situation, and make decisions about mortgages. An algorithm called Compas (Correctional Offender Management Profiling for Alternative Sanctions) is used throughout the US to assess the extent to which defendants awaiting trial or sentencing are at risk of reoffending, and whether they can be released on bail. The use of artificial agents as decision makers has become a significant concern, not only for society and governmental organizations, but also for technological corporations such as Google, Microsoft, Facebook and Amazon. There is a clear backlash if these systems make morally questionable decisions. The challenge, then, is to build ethics into AI systems. 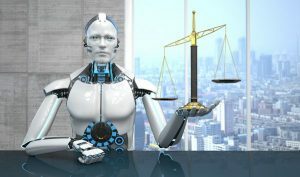 The ultimate goal and ‘man on the moon’ project is the development of an artificial moral agent which is able to make complex moral decisions and act upon them. This requires the ability for moral reasoning and ‘all things considered’ judgements, taking into account relevant knowledge about the social and physical context, relevant knowledge about the humans involved, as well as the moral values and principles relevant for the situation. The research meet will address some of the many challenges in integrating ethics within AI, and developing artificial moral agents. 12.40 – 13.25 Is it Time for Robot Rights? This event is organised by the TU/e Center for Humans and Technology, in collaboration with the Data Science Center Eindhoven (DSCE) and the High Tech Systems Center (HTSC).